Blurb: A decorated policeman is murdered on the tranquil grounds of the St. Peter’s Police Treatment Centre, shot through the heart with a crossbow arrow, and compromising photographs are discovered in his room. Detective Chief Inspector Alan Banks is well aware that he must handle the highly sensitive and dangerously explosive investigation with the utmost discretion. And as he digs deeper, he discovers that the murder may be linked to an unsolved missing case from six years earlier and the current crime may involve crooked cops. Review: I received a copy of this book for free from the publicist for review purposes in conjunction with a blog tour, all opinions expressed below are my own. 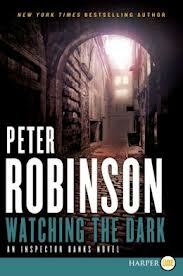 For whatever reason, I have never read a Peter Robinson book. Since there are (only) 20+books in the Inspector Banks series, it’s been a bit of an undertaking. I’m usually adamant that I have to read the entire backlist. For whatever reason, I chose to read this book knowing that it is the 20th book in the series. Going into it I didn’t really know what to expect. I had no idea if I would be completely lost by jumping into this series at this point or if it would be just fine. The truth is that it’s somewhere in the middle. I wasn’t completely lost reading this book, but there were some questions about relationships between certain characters that probably would have been helpful to have the background information. Now that I have that way, I have to tell you that I was pleasantly surprised by this book. The writing was very good, the storyline was interesting, the characters were extremely well-developed. It was an all-around good book. There’s not much for me to really complain about, to be honest. I really liked Inspector Banks’ character. There was something about him that worked. He was a nice guy, but he also knew how to read the situation and react as necessary. I felt it was very interesting to “work the case” with him and Joanna. At times I wondered if he was on a wild-goose chase in regards to the Rachel storyline, but I found it really enjoyable to see how everything came together in the end. Banks has one of those guts that was spot-on in this case. I also liked Joanna’s character. I’m not sure that she has ever been mentioned in previous books, and I’m not sure what kind of a presence she will have in any future books, but I found her to be an interesting character that I would want to know more about after what she reveals to Banks at dinner one night. Overall I would most definitely recommend this book. It’s not necessarily a book that will have you up all night turning the pages, but it’s definitely a book to be savored. I thoroughly enjoyed it and look forward to keeping Mr. Robinson on my watch list in the future.